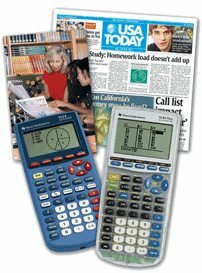 FREE online educational math resources integrating USA TODAY content with Texas Instruments technology. are dedicated to engaging students in timely, relevant, real-world information integrated with TI graphing technology. were written by experienced math educators and based on USA TODAYs articles and signature Snapshots® and infographs. have been specifically designed to explore topics in pre-algebra, algebra, geometry, pre-calculus, calculus or statistics. meet the National Council of Teachers of Mathematics standards. In this activity. using the USATODAY infograph, “Ballooning inside the box,” students will explore geometric relationships using similar triangles. Using the USA TODAY Snapshot, “Dangerous births,” students will explore the geometric relationships of triangles using perpendicular bisectors of the sides. The USA TODAY infograph, “When the snow is as high as an elephant,” helps us understand snow from a more practical point of view. This activity illustrates a real-life problem that uses trigonometry to solve for an unknown. Is leisure time really shrinking? Students will have the opportunity to organize data from the USA TODAY Snapshot. In this activity, students will determine the rate of change (slope) & build a linear model (y = mx + b) from data. Students write exponential equations based on the percent of increase of college costs and will graph and interpret these equations. In this activity, students will read about the changes in the “new money” and then create a graph to represent various combinations of currency produced. In this activity, students will investigate exponential functions and their graphs using real-life data. In this activity, students will be asked to use the “Wildfire deaths” data to determine a linear model. In this activity, students will explore scatterplots and independent and dependent variables. Students will explore data that will be modeled by a logistic function. Students calculate the actual number of those surveyed who believe the environment is in “fair” condition.